The FMC Peace Library was established to promote reading by members and regularly attending non-members. Our collection contains over 2,000 books, audio books on CD and cassette, and fiction and non-fiction DVD titles for all ages. Themes represented include Mennonite and Anabaptist history and theology, peace theology, Christian spirituality, and much more. Our library provides support for the FMC Christian Education program as well as Worship Commission, personal and group Bible study. On occasion, themed reading lists are available. We strive to support members’ pursuit of special interests such as local food production, creation care, world and seasonal cooking, parenting as a spiritual discipline, and reading for enjoyment and enrichment. The library participates in the Central Plains Conference Shalom Readers’ Club program (http://www.centralplainsmc.org/shalom-readers.html) for children from pre-school through 8th grade. 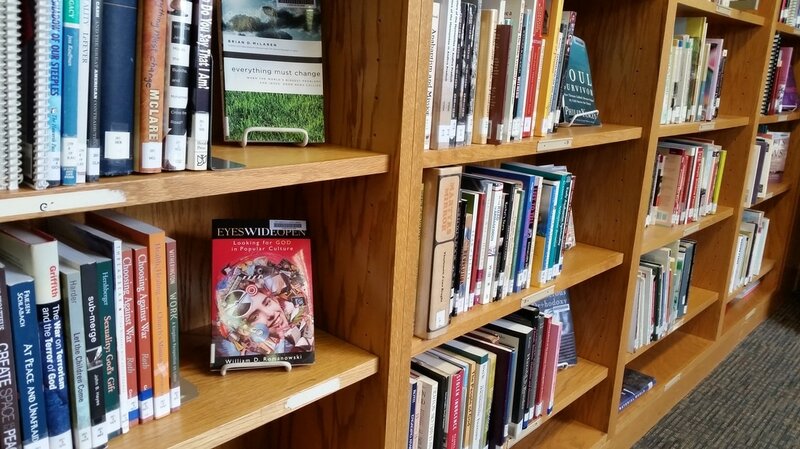 Many of the suggested books are available at the FMC library. We also have access to the extensive print and electronic resources of the Western District Mennonite Conference Resource Library through a partnership with Central Plains Mennonite Conference. FMC members can apply for a library card and access their resources through their on-line catalog (http://mennowdc.org/library/). The library is open during all times that the church building is open. A librarian is available to assist users immediately following the Sunday morning church service. Items may be checked out for four weeks. If you have any questions about our library, please contact us.